The region of Upper Franconia in northern Bavaria, Germany has the highest number of breweries per capita in the world with some 200 independent breweries located within its borders. Nine of those breweries can be found in the town of Bamberg in the southwest, including Schlenkerla and today’s featured brewery, Kaiserdom Privatbrauerei. The history of brewing in Bamberg dates back to 1039; the brewery that would become Kaiserdom was established nearly seven centuries later in 1718 by a brewer named Georg Morg who had obtained permission to brew for a pub owned by monastery St. Michelsberg. The brewery was purchased in 1910 by Georg Wörner. It is today owned by his grandson, a graduate of University Weihenstephan. The brewery changed names multiple times during its history; the name Kaiserdom first appeared in 1972. 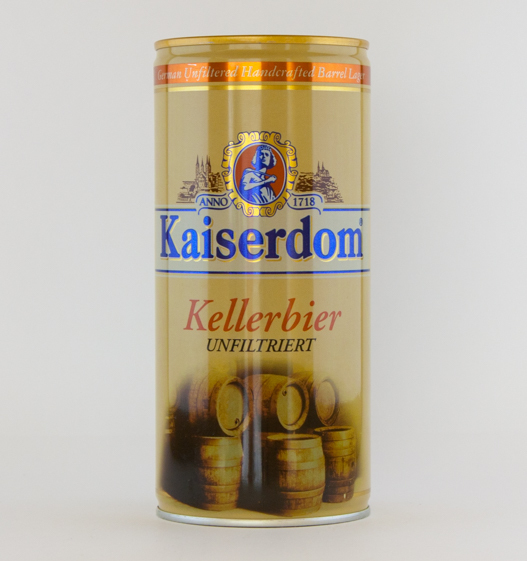 Today, Kaiserdom is among the most successful private breweries in Germany with products being shipped to six continents and over fifty countries. The brewery’s regular lineup of six beers includes a hefe weissbier, a dark lager, and their most popular—a pilsner. Despite brewing with only four ingredients—malt, hops, water, and yeast—and often with the same varieties, brewers in Germany have invented a staggering number of beer styles. As a result, the difference between styles can sometimes be very subtle. Today’s featured style, kellerbier (“cellar beer”), like many German lagers, is stored for months at low temperatures and showcases malt over hops. The resulting strength is comparable to that of oktoberfestbier. Kellerbier’s distinctiveness comes from its being conditioned in unbunged casks with active yeast left mixed in, which allows the carbon dioxide formed during the remaining fermentation to escape rather than become dissolved into the liquid. As a result, kellerbier has relatively low carbonation. The finished product is also left unfiltered, which produces a very cloudy beer which gains body from the suspended protein. The sediment in kellerbier may also give the beer a yeasty flavor akin to bread dough. This is a desirable quality in some styles, perhaps most commonly in German wheat beer. 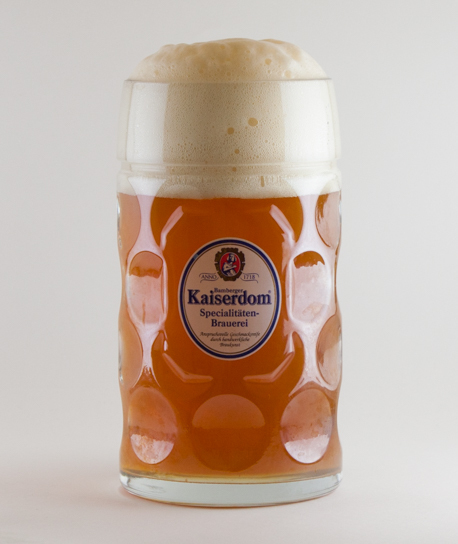 Although relatively rare outside Germany, kellerbier is a popular choice among patrons at local beer gardens in Franconia, where it is often served directly from casks in earthenware mugs. Upon pouring, K aiserdom Kellerbier indeed appears cloudy and has a dark orange-ish amber hue with a thick, off-white head. The aroma includes flowery, spicy hops and yeasty white bread with a bit of caramel after it warms up. In the flavor is lots of delicious, delicately sweet, bready malt. The hop bitterness is gentle and the hop flavor is flowery, herbal, and a little earthy. There is some sourness from the yeast. Loads of grainy malt hang around in the aftertaste. The sediment and low carbonation give it a somewhat creamy texture and a body on the light side of medium. Overall straightforward but very good all around. It’s modest but cleanly flavorful and satisfying. As I’ve said before, I really love malty beers, and this one doesn’t disappoint. The firm, tasty malt is reminiscent of a bock’s—moderately sweet and toffee-like—but not as strong. The yeast and mild hop bitterness give it a slight sourdough-like twang, which makes for an offsetting accent against the pervading bready malt. Today’s beer was purchased at Yamaya in Ota, Japan. This entry was posted in German Beer, Mad Capper Reviews and tagged Kaiserdom, Kellerbier, unfiltered. Bookmark the permalink.